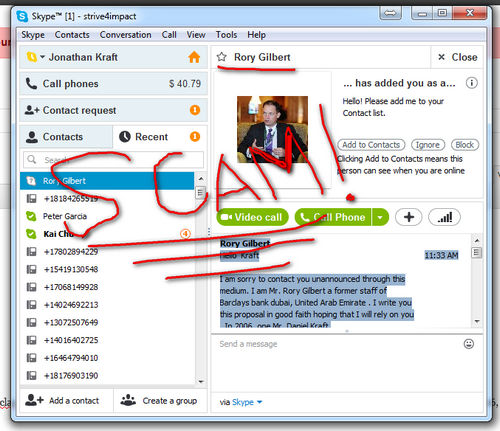 I’m being scammed/spammed via my Skype account from a Rory Gilbert. Of course, it’s simple for scummy scammers to create thousands of fake Skype accounts and send out scams and spam like this. 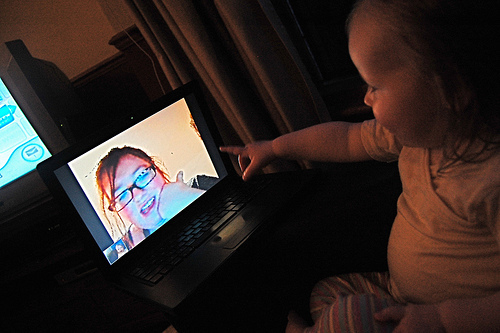 In any case, if you hear from this particular Rory Gilbert on Skype, you should know that this is a scam. Note that he never uses my name. He’s just looking for anyone with the common last name of Kraft. The typical NIgerian 409 Fraud Scam, perpetuated via Skype. who has same name as yours and who has your country in his file as his place of origin, made a fixed deposit for 36 calendar months, valued at $18,400,000.00 with my bank. I was his account officer before I rose to the position of Manager Director now. The maturity date for this deposit contract was 16th of January 2009. Unfortunately, while on a business trip ,he died in a deadly earthquake that occurred on May 12, 2008 in Sichuan province of China which killed at least 68,000 people. Since the last quarter of 2009 until today,the management of Barclay’s bank have been finding a means to reach him so as ascertain if he will want to roll over the Deposit or have the contract sum withdraw .Since September 2009,when I discovered that this will happen , I learnt of his death ,so I have tried to think up a procedure to preserve this fund and use the proceed for charity . Some directors here have been trying to find out from me the information about this account and the owner, but I have kept it closed because, I know that if they become aware that Mr Daniel is now late, they will corner the funds for themselves. Therefore, I am seeking your co-operation to present you as the one to benefit from his fund at his death since you have the same name, so that my bank head quarters will pay the funds to you. I have done enough inside bank arrangement and you only have to put in your details into the information network in the bank computers and reflect you as his next of kin. I am not a greedy person, so I am suggesting we share the funds equal, 50/50% to both parties My share will assist me to start a charity organization to help the poor and also own a company which has been my dream. Let me know your mind on this and please do treat this information as TOP SECRET. We shall go over the details once I receive your urgent response strictly through my personal email address, mrrorygilbertel@gmail.com Have a nice day,and may GOD bless you. I have blocked this user on Skype and reported the message as abuse.